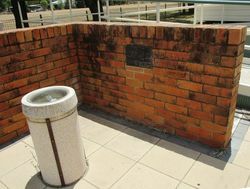 A fountain commemorates the opening of Cecil Plains Water Supply in June 1960. By The Honourable A. R. Fletcher M.L.A. Speaker Of The Legislative Assembly on 11th. June. 1960. 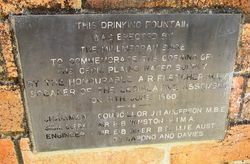 Chairman : Councillor J. H. Anderson M.B.E. Shire Clerk : Mr. F. B. Winston F.I.M.A.